Well done to Mary (53) who after taking part in our Jobmatch programme has secured employment with MITIE as a Domestic Assistant. For the past number of years Mary had been in and out of jobs on short term contracts even though she had a wealth of experience as a Domestic Assistant. 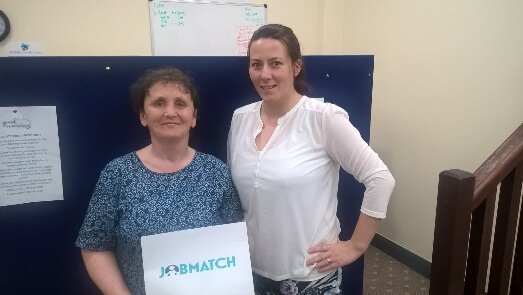 When she joined our Jobmatch programme her confidence and motivation were low as although she has been getting interviews she was unsuccessful in gaining a job. Through our Jobmatch programme Mary took part in our Coffee with Crafts workshops which was a fantastic boost for her confidence and introduced Mary to skills she never though she had whilst gaining a Level 1 Certificate in Vocational Skills. Mary also enhanced her CV by completing a Level 1 Award in Food Safety Awareness in Catering. Mary worked with her Employment Coach to ensure that she developed her communication and interview skills while continuing to apply for jobs. Her dedication and perseverance paid off as she was offered a job with MITIE as a Domestic Assistant. Mary advised “I am so happy to be back working and cannot thank you enough for the support you have given me”. If you are unemployed and would like to find out more about the support we can offer call 028 7963 1032 or email info@networkpersonnel.org.uk.